This Dreadnought distills the essential features of a great acoustic guitar into a budget-friendly form. Our Academy Series was designed with developing players in mind, so the goal was to create as comfortable a playing experience as possible. The guitar body pairs layered sapele back and sides with a solid Sitka spruce top, and incorporates a feature normally reserved for our premium instruments: a built-in armrest that softens the edge of the body’s bass-side lower bout to enhance the playing comfort. 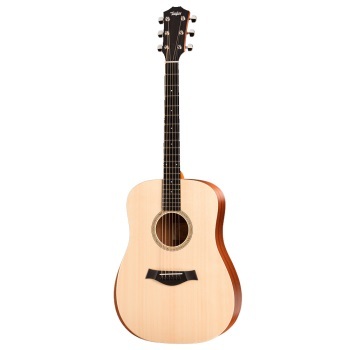 The patented Taylor neck features a slightly shorter 24-7/8-inch scale length, 1-11/16-inch nut width, and light gauge strings, which make fretting and bending strings easier. Tonally the Dreadnought’s body dimensions produce a bold response with a warm low end and punchy treble, making this a great option for strummers and flatpickers. Onboard ES-B electronics include a built-in digital chromatic tuner with an LED display for tuning and low battery indication. Whether you’re at the front end of you guitar journey or just looking for a great strumming guitar without breaking the bank, the A10e will serve you well.